Every girls night in needs a movie that will make you and your squad laugh their butts off! Look no further than Girls’ Trip! Its a hilarious comedy about a group of women reconnecting at the Essence Music Festival. With a great script and stellar all-star cast, this movie is sure to get you hype, especially if you all are on your way to the festival yourselves. Definitely a great “road trip” kind of film! Inspirational films are a dime of dozen but Hidden Figures is extra special because it tells (what was!) a virtually unknown story within black history and American history as a whole. A story about the first three black female mathematicians to work for NASA at a time when racial tensions were at its highest level, Hidden Figures is an entertaining film that will motivate you and your friends to always rise above. There’s a reason why this film is a classic. It’s a film that women can still relate to. Waiting To Exhale follows a group of close friends who all have trouble in love; waiting for the right man to commit to. Whitney Houston and Angela Bassett lead the incredible cast and Houston deliver her hit “Exhale (Shoop, Shoop) that will leave you and your girls a new theme for ya’ll to sing to. It’s a movie that will bring your squad closer together. One more classic to throw into the bunch. 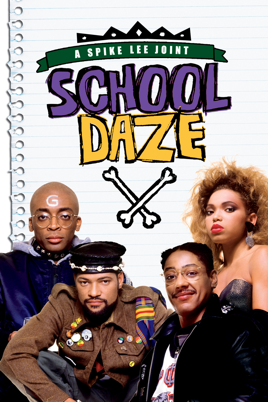 This time its Spike Lee’s School Daze. What’s great about this film is that it’s not just about a battle between sororities and fraternities in a black university but rather an exploration into black culture issues such as colorism and black hair texture. Overall, this is a fun musical comedy that you and your squad will enjoy! Hopefully, these films sparked your interest! What films do you and your squad enjoy watching? Let us know in the comments.